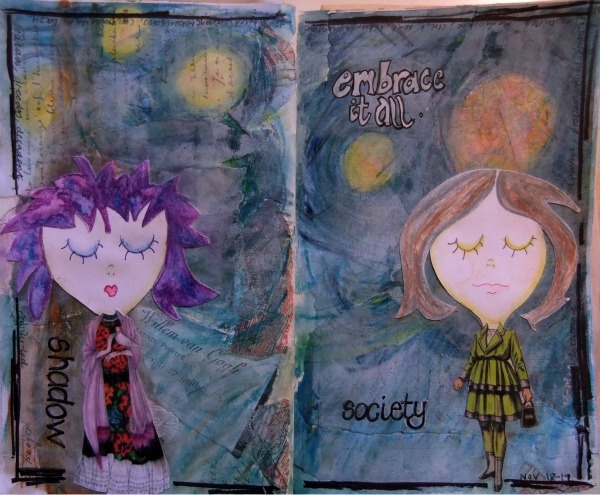 Art journaling is pretty addictive, it turns out. It’s certainly helping me through this time of uncertainty. I’ve been taking some classes, and each brings it’s own influence to bear on my pages. Being a beginner is fun, of course – it’s all quite new and exciting. But not having developed my own style yet, and not being quite skilled enough to transfer what is inside my head (and heart) to paper, can leave me feeling a little frustrated. Mid-week I was itching to lay something down in my ‘messy journal’ : a hardback copy of Alexander McCall Smith’s novel, The Lost Art of Gratitude, which I’m altering page-by-page. There on the shelves was a book I have about Vincent van Gogh, and I remembered that it was full of van Gogh ephemera ; letters by Vincent to his brother Theo; receipts for supplies ; maps from time spent in Paris … I had the idea to copy some of those documents and use them as a background for a double spread. That messy collage background then inspired me to take my new watersoluble crayons and loosely recreate one of van Gogh’s Starry Night’s paintings over the top. Then, what’s a girl to do? I had an idea of a self-portrait, representing my shadow. Me, with a bandage over one of my ears. And of course, I couldn’t figure out how to do it, so I settled on drawing two quick images of a whimsical me. One was my daytime society persona. The other, my underground persona – the one whom the mothers of friends and boyfriends didn’t ever approve. This was an idea I’d gleaned from Violette Clark’s 21 Secrets class, Me and My Shadow. I drew them onto card stock, used the water soluble crayons for colour and stuck the wee heads onto my Starry Night landscape. With no patience for an attempt at collaging or painting the bodies, I searched for some paper doll printables here and here and stuck them on. Looking at both the little miss me’s, both of them were representative of my shadow self, in actual fact. Even little miss society there on the right. She was inspiring words like “proper, controlled, strict, neat and tidy.” Little miss shadow on the other hand evoked “greedy, decadent, jealous and contrary.” And when I looked further, I thought she looked like she was praying (she’s holding a dove). Certainly, she’s not as base as I think of her. Perhaps the “restrictive” side of my shadow is showing herself up in this picture as a message to loosen up, and really feel what’s inside. Although it seems that when van Gogh did just that, finally dismissing his preacher/art-dealer society persona and embracing the artist that he was, destruction loomed. But only after two years of producing the most glorious artwork I’ve ever seen and changing the course of art history. What’s for certain is that this act of art journaling is contributing more than its weight in gold to my mid life crisis beautiful life. Feeling deeply in times of such uncertainty and fear may in fact prove more destructive than helpful, but awareness is key. When I’m art journaling, I’m present in the now. I know who I am. And I love me. I think I could use something like Art Journalling. I must research this. So looking forward to coming to one of your workshops.